MARS (Motorcycle Awareness and Rider Safety) is a group of civic minded motorcycle riders who have gotten together to try to make a difference in the valley. Since MARS’ main focus is education and awareness, we really had to work hard to make our first big event count. Through a lot of hard work, we have managed to get Lee Parks (owner and chief trainer, total control advanced riding clinic) to come out to Las Vegas to help us out. This will be 2 days of great, never before offered, education for Las Vegas Motorcycle riders. On Sunday April 20th, for the first time in Las Vegas, Lee Parks will be teaching his advanced riding clinic. This is an 8 hour intensive course that will make even the most experienced and skilled riders become a better, safer and more confident rider. The course is broken up into both classroom and on motorcycle exercises. Theory is taught in the classroom, immediately followed by exercises on the range. Each rider gets immediate feedback on their progress. This is unusual to have this level of feedback from the instructors in any class. That is why Lee Parks and his ARC Class were chosen for our Safety Fair. For more information on the class, see attached flyer or go to www.totalcontroltraining.net. 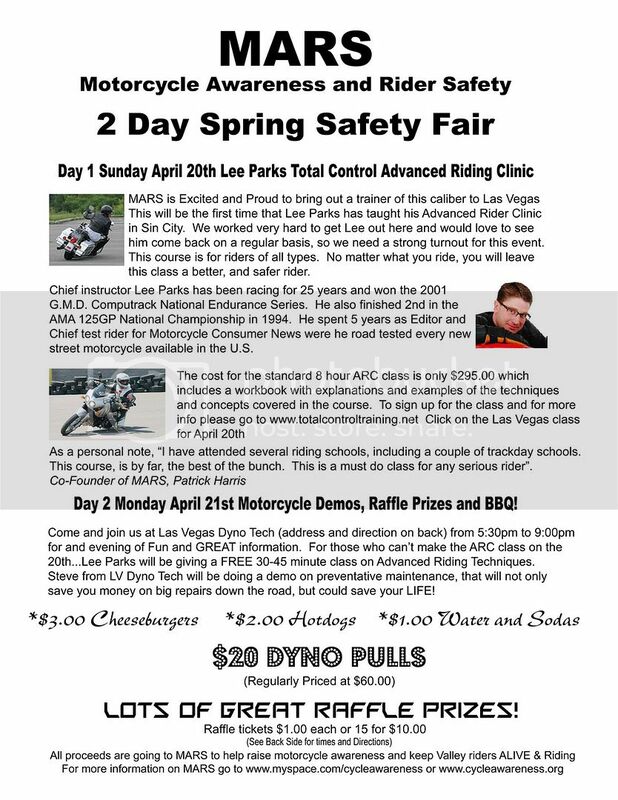 On Monday April 21st Las Vegas Dyno Tech will host our Safety Fair. This event is free and open to the public. Lee Parks will be doing a 45 minute presentation on advanced riding techniques. The owner of Las Vegas Dyno Tech, Steve will be doing a demonstration on important basic motorcycle maintenance. There will be lots of raffle prizes, food, drinks, music and great information. It is basically a great bike night that actually has an educational component. Our goal with this 2 day event is to create educational experiences that have never before been offered to Las Vegas riders. We believe the better the rider is the better their chances are of staying alive and returning home to loved ones. MARS will organize or be involved in 6 safety events per year. For more information on what MARS is about, go to one of the websites listed below. 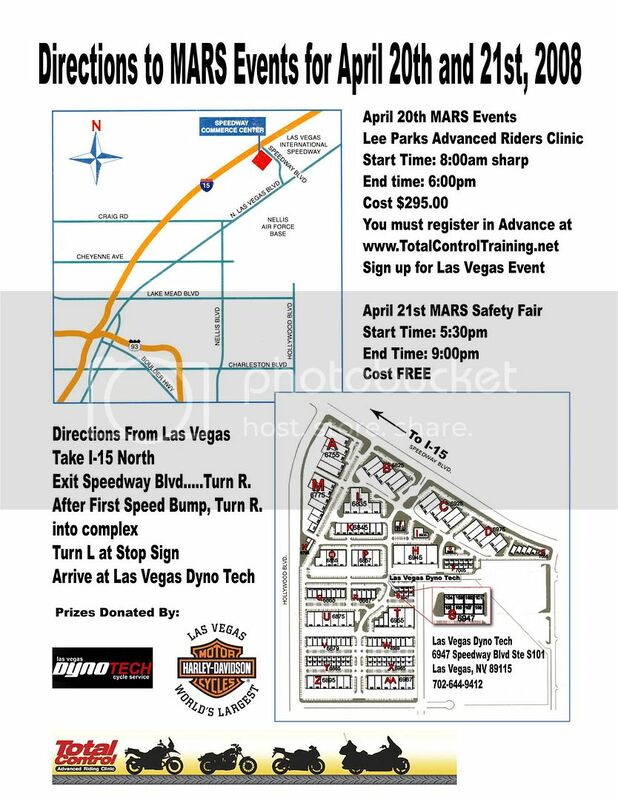 For more information on the Safety Fair or MARS, Please contact Pat Harris at 702-277-3794 or e-mail vegasvideo@hotmail.com. If you can not send a news crew to the event, video and stills will be available. Video is available in both HD and SD (Please specify ahead of time what format you require). Photos will be available in Jpeg format. You're such a polite young soldier...Now drop down and give me 20! 20 bucks that is....I'm kinda broke! and I thought I was dropping down to pick up the twenty you dropped a few min ago..